So many of you are close to completing my free Vision Board Challenge. It’s been so wonderful to go through the journey with you! 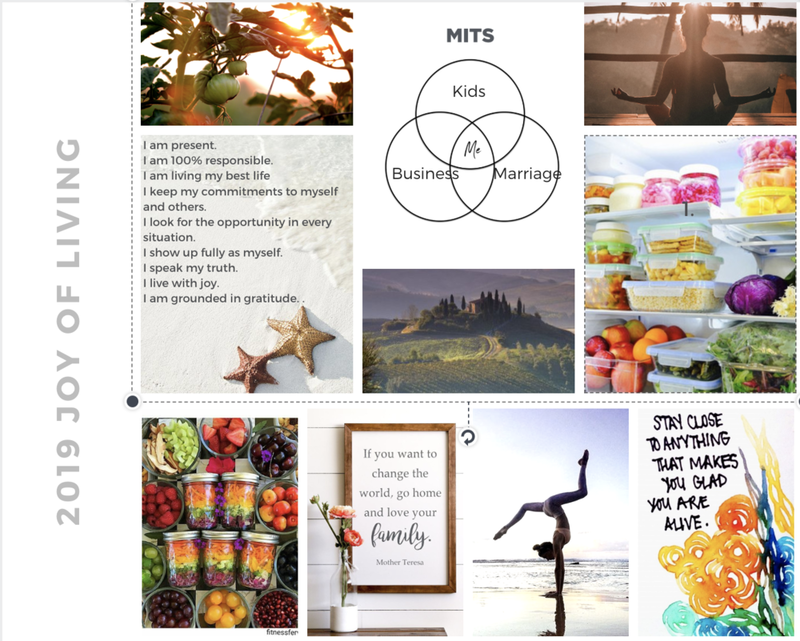 If you missed it, or are still wondering about this Vision Board thing, then read on. Your brain thinks in pictures. Any of these resonate with you? A Vision Board is a powerful way to become clear on what you want. It gives you a tangible picture of your goals and dreams. If you believe in the law of attraction, then you know that these images can draw you to your vision. But even if you don’t, i believe that you program the brain to get focused on the direction that you want to go. I very much believe that you get what you focus on. There is no magic in the board itself. You are getting a clear vision for what you want in your life. Advertisers spend billions of dollars to get their message in front of you. This is your opportunity to advertise to yourself. I have created Vision Boards for over a decade. In the early years, I would sit with a pile of magazines and clip pictures that inspired me or moved me. It was a fun and crafty way to do it. But honestly, it wasn’t that strategic. Over the years, I have created a process that helps me think through the different areas of my life. I think about what’s most important to me, what do I want to have, to do and to be. And with the ease of an internet search, I can find images that represent those desires. The images are symbolic of my intentions. They don’t necessarily spell them out. They are very personal to you and your life. In my Vision Board Challenge, I walk you through step by step, what to consider and how to find the images. Please feel free to access the Challenge now and do it when you are ready. You can create Vision Boards for all aspects of your life or just zero in on your health or a specific goal. You can create Vision Boards for the year or for big hairy audacious goals (BHAG’s) that may take 5 - 10 years. The point is to dream and to get excited about what you want your life to look like. It should excite you and make you feel good to look at your Vision Board. Will all of your Vision Board come true? Goodness no. If you are dreaming big, it will not all come true….right away. If you do not take action on your vision, it will not come true. It’s not magic. There are a few things on my Vision Board that have been there for years; like being a NY Times Bestselling author. I am not a failure because I didn’t achieve it. I’m working on getting there and it’s still part of my dream. What’s that saying that if you shoot for the moon, at least you'll land amongst the stars? Let’s just say that I feel like I’m landing amongst the stars! When you create your Vision Board, make sure to put it up in a place that you will see every single day. Mine is on my medicine cabinet and I look at it each time I brush my teeth. You might put yours in front of your computer (or make it your home screen) or put on your refrigerator. Just don’t tuck it away to be forgotten about. Now a wish without a plan is just a dream. Not sure that’s quite how the saying goes but you know what I mean. After you create your Vision Board, start your goal setting. Reverse engineer how you can make it happen. What would need to happen to make that vision come true? What are the steps? If you are part of my Vision Board group, you’ll get more info on how to do that too! I hope you do go ahead and make a Vision Board. If nothing else, I hope you dream and get clear on what you want in your life. You are the architect of what you want this life to look like. Get ready to create a life YOU LOVE to live with Lisa Druxman! Share your info and get a free meditation pack to get you started on creating your life with intention and ease!